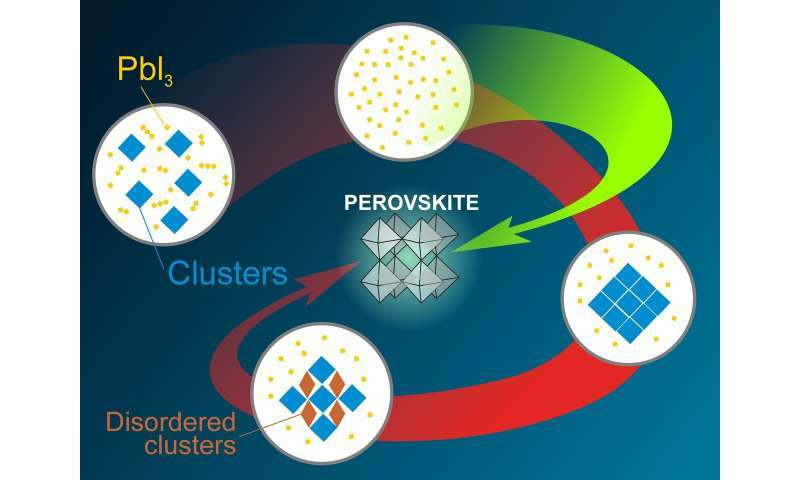 A RUDN professor, together with his colleagues from other Moscow universities, has described the mechanism of byproducts produced in the course of the synthesis of perovskites—minerals that have numerous prospective applications, e.g. as superconductors. The discovery could make their production faster and more efficient. The article was published in Chemistry of Materials. Perovskites are crystalline substances that consist of two or more metals and contain three oxygen atoms. These materials are used as superconductors, in solar cells, lasers and sensors. The crystal structure of perovskites is formed in solvents such as dimethyl sulphoxide (DMSO), dimethylformamide (DMF), and gamma-butyrolactone (GBL). The main issue with their synthesis lies in the formation of intermediate compounds between the initial substances and the molecules of a solvent. This complicates the crystallization process and reduces the volumes of the end product. The authors studied the structure of intermediates that formed in the course of perovskites synthesis in GBL. The study was based on perovskites that contain lead and atoms of different halogens (chlorine, bromine, and iodine). To see the compounds formed in the course of the reaction, the researchers used Raman scattering spectroscopy. During the experiment, the chemists changed the ratios of initial synthesis components and studied the structures formed in each case. "We were the first to find three types of intermediary phases that are formed in the course of perovskite crystallization in gamma-butyrolactone. The first type is similar to the structures that are already familiar to us, while types two and three are new super-octahedral formations. We also found out why it happens. At high concentrations of iodine ions in a solution, the structure is dominated by small-sized molecules consisting of one lead and three iodine atoms. However, as the concentration of iodine ions goes down, the solvent starts to play the leading role. Complex super-octahedral shapes of the intermediaries are formed under its influence," says Viktor Khrustalyov, a co-author of the study, Ph.D. in Chemistry, and head of the Department of Inorganic Chemistry at RUDN. Having studied how intermediary products that slow down the reaction and reduce the volumes of the end product occur in the course of a reaction, the chemists developed a method to avoid it. To do so, they suggested depositing perovskites as thin films and also using initial solutions with higher iodine concentrations.